This fortnights challenge of Easter is a nice easy one. I don't give out Easter cards so for this challenge I used a super digital die cut from My Scrap Chick I purchased last year to make a small basket which I then filled with an assortment of mini eggs. This was so much fun to make I then made a second on lol. 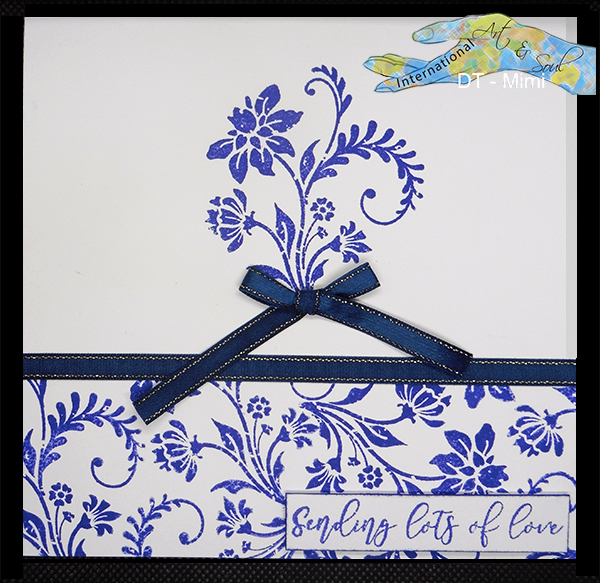 I love the way this die cut basket looks like a fence and in keeping with that I coloured my card a light brown colour once cut and then rubber stamped in black with a wood texture stamp. I then made a couple of simple labels using stamps from an Easter set I bought ages ago, another of those sale items that seemed like a good idea and this is the first time it has been used in over 5 years. The yellow layer behind the sentiment layer on the label is also stamped and then heat embossed. To finish off I added a simple bow. I have had this jigsaw die for absolutely ages, think I picked it up in a sale knowing I had got a bargain then never used it. 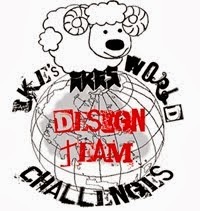 How fabulous is it for this challenge :). To make my card I embossed some design paper and used it to cover my card blank. I then printed Ike's digital image, Peony Corner and coloured it with Promarkers. 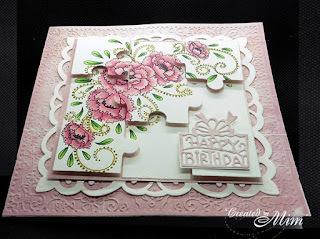 Using the jigsaw die for the cutting of the image I then mounted alternate pieces using 3D tape. onto pink pearl paper. 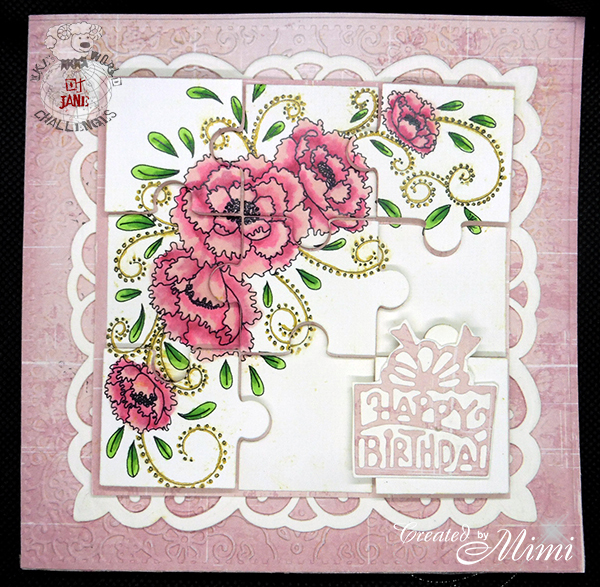 Finally a small happy birthday die which my daughter gave me last Christmas, Oh and another die cut lacy square which I used under the image layer. I have no idea what was going on when I photographed this card, so squint and I apologies for that, must have been a bad day lol. This fortnights challenge of CAS with Blue has been chosen by Maggie. Certainly had to get my thinking cap on for this one lol. I ended up making two cards, the one below which I don't really like and another but it turned out less CAS and more arty so did not really fit the challenge theme so I have had to go with this one. 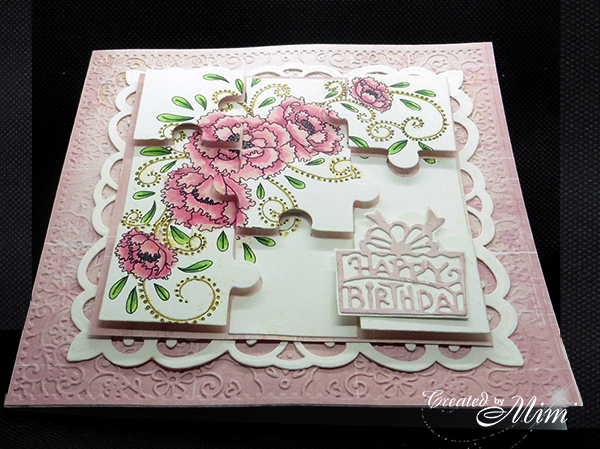 I did have a lot of fun making this with lots of stamping in one colour but it just feels so unfinished. Never mind, a learning curve for me. 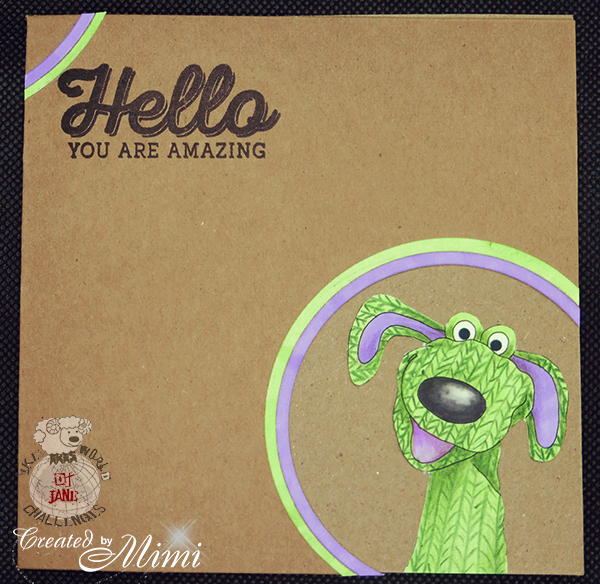 For my DT creation for this challenge I used one of the sock puppet images from the SOCKIES set, such a fun set of images that you just can't help smiling at. I coloured the image with Promarkers then added a bit of shading and the knitted pattern with Prismacolour pencils. The image was then cut out ready to go on the inside of the card. 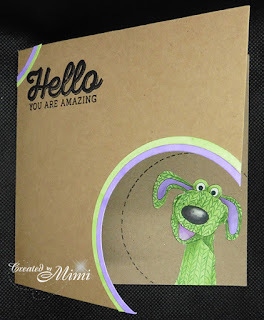 Next I cut a couple of circular strips and coloured them to match the sockie dog and using the smallest of the circles I was working with cut the corner off the card blank. Only a wee bit of stamping to do, the sentiment and then it was time to assemble. I recycled the box of Ferrero Rocher chocolates I bought to fill my Christmas cracker project (well sort of recycled as I had to buy another box just to fill this one hahaha) ready to give my daughter for her Birthday. 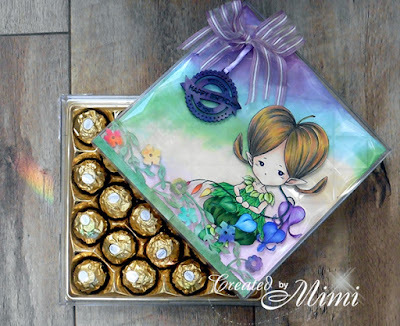 When looking at the box I loved the moulded design and wondered what it would look like with a background behind it and WOW, I love how it added so much texture and light to the simple rainbow coloured colouring I did with Distress Oxides, so simple and yet so effective. The sprite was coloured with Promarkers and Prismacolour pencils then fussy cut and added to the front of the box. 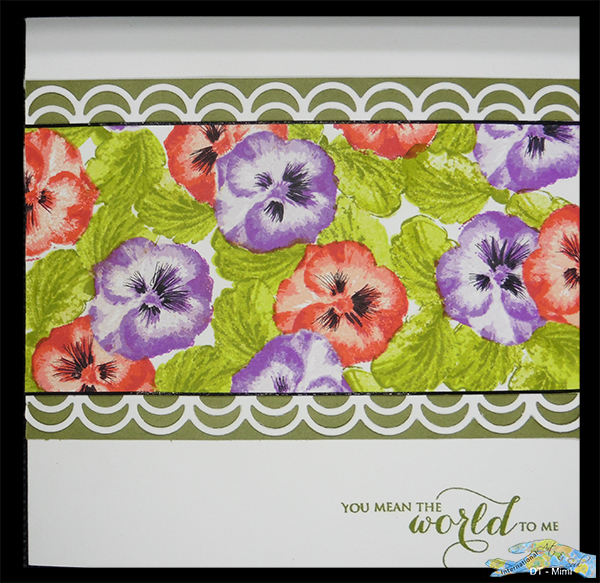 A simple flower die cut border finished off the ground she was standing on perfectly. 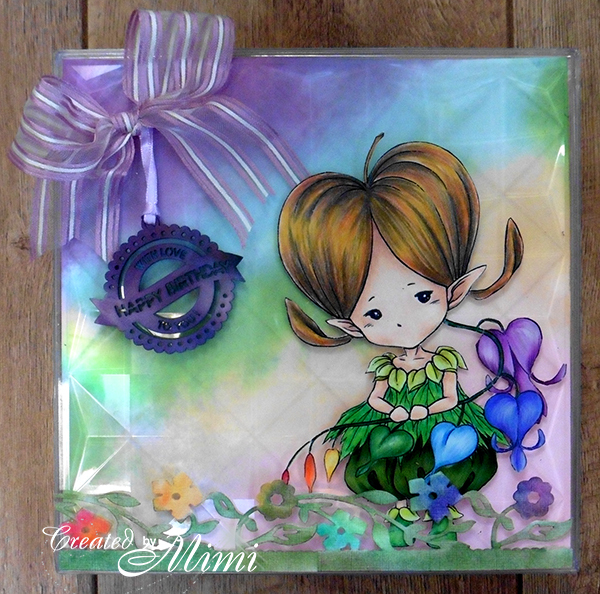 The final finishing touches of the bow from a scrap bundle of ribbon I bought and a chipboard Happy Birthday sentiment coloured with Promarkers completed this project. Natasha's birthday has been and gone now and she loved her decorated box and the yummy contents inside :) a great success. chipboard sentiment, ribbon, die cut border and chocolate box complete with mouth watering chocolates!!! Craft-Dee BowZ (M P1, E3, project must have hand-made bow) Anything Goes with a Handmade Bow. 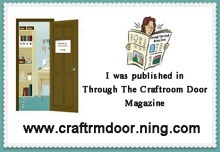 This fortnights challenge of Sequins and/or Beads has been chosen by CG. 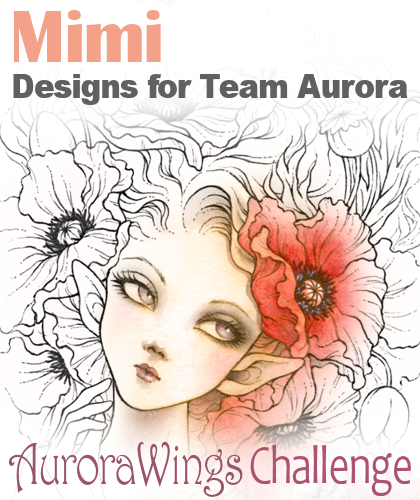 Oh boy, I found this challenge pretty hard until I got off the idea of making a card lol. I gave all my sequins away a couple of years ago as I don't use them but I have a ton and a half of beads which I have collected on my travels and from charity shops etc. At the moment I am trying to make flat cards that just slide into an envelope and don't have any bulges as I am pretty mean and hate paying the ridiculous postage here in the UK for anything that does not fit through a small slot in the cardboard testing thing the post office use. 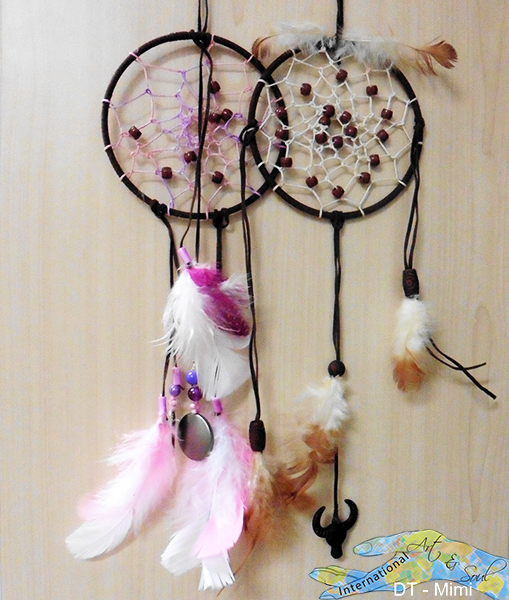 Thankfully I remembered I had a couple of dreamcatcher kits that I bought ages ago so decided to make them up. The brown one on the right was made using only the pieces that came in the kit but for the one on the left I changed the design a bit, added my own feathers and central hanging bit with a lovely big brushed silver bead and some smaller beads in pink. The string on the pink one was coloured with Promarkers and instead of have the beads in a symmetrical layout I just them them fall in almost as they pleased. Photographs on this blog are copyright, please do not use them as your own. Thank you. Watermark theme. Theme images by nicodemos. Powered by Blogger.